← Help Me, Dearest Readers! Woops! Just realized I forgot to do Film Review Friday… I’m not even done with finals and already lost my days of the week! Sorry! To begin with, I’ve meant to watch this movie ever since it came out and never got the chance! I knew I’d love it, because Sir Ian McKellen says so and Sherlock Holmes has been my favorite literary character since middle school! Mr. Holmes is the telling of Sherlock Holmes very late in his life, suffering from dementia, trying to solve the mystery of why he stopped being a detective. Living in the well known final home of Sherlock Holmes by the sea with his apiary, we see an old, feeble Sherlock Holmes who is trying to find treatments for his dementia so he can recall his final case. He knows he had some reason that his last case caused him to stop being a detective, but he does not remember it. Urged on by the son of his housekeeper Mrs. Munro (Laura Linney), Roger (Milo Parker), he writes down everything he can remember in his more lucid moments where his memory is best. I went into this movie already knowing it would be so sad. The thought of Sherlock Holmes outliving everyone he knows and then losing his memory and his deductive abilities is heartbreaking enough on it’s own. No other sadness need apply. However, you enter the movie in post-World War 2 era and the scars of the War are prevalent through the entire movie in the most gutwrenching ways. When Sherlock is in Japan with Mr. Umezaki, the devastation is very well presented. When Mrs. Munro talks about her late husband with Roger and with Mr. Holmes, it is very stark and real. 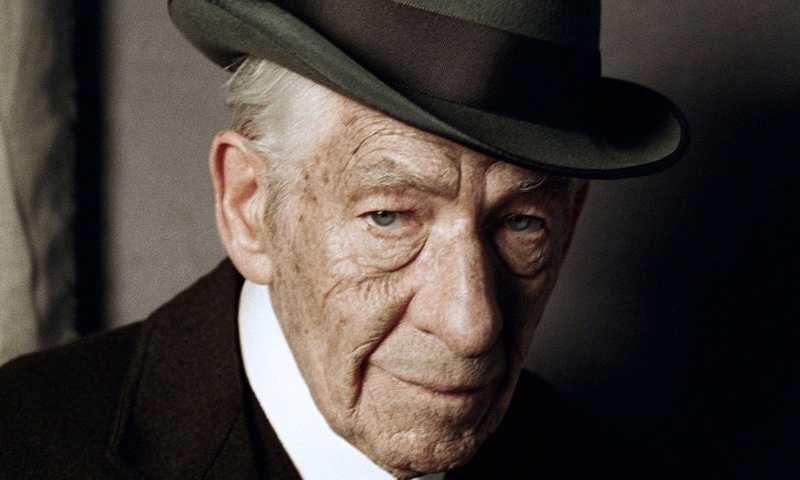 So even on top of Mr. Holmes’s mental frailty, there is an undercurrent of tragedy throughout the movie. The case itself unfolds beautifully. I’ve seen some say that the twist is a shocker that’s impossible to guess, and in a way there is a shocking twist, but I did guess the end result, just not the way it happened. It didn’t make it any less sad, though. The ending is very beautiful so it makes up for the scare we all get from the sadness. Without giving away too many spoilers, all I can say is that it is a beautifully moving movie, Sir Ian is magical as always, and little Milo Parker is a wonderful co-star for Sir Ian. This entry was posted in Movie Review and tagged 7/10, Bill Condun, Drama, Ian McKellen, Jeffrey Hatcher, Laura Linney, Milo Parker, Mystery, Rated PG. Bookmark the permalink. Know any place where I can download it from? I don’t actually download movies, so no, I’m sorry. But it’s on Putlocker if you’re the streaming type.